Yes! 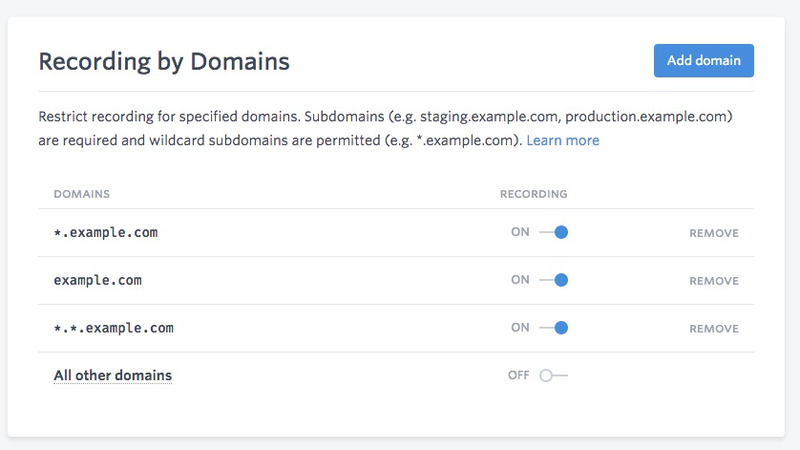 You can selectively manage and control which domains you allow to record to FullStory, preventing things like test or staging instances from generating sessions. No need to modify or bifurcate your code, simply click a switch to enable or disable a domain or subdomain. Navigate to Settings > Recording to add excluded or included domains. We'll start with a high level screenshot and then dive into individual areas and examples. Click the "Add domain" button to add a new domain to the list. When ON, every individual domain where recording is OFF is effectively blacklisted. When OFF, every individual domain where recording is ON is effectively whitelisted. You can specify wildcards (*) at any subdomain level which will match any text at that particular domain level. Keep in mind that wildcards only match at the specific subdomain level, not all subdomain levels. Let's look at a few different examples. In this example, immediate subdomains of example.com will be recorded, but the "naked" example.com will be blocked. Visits to "www.example.com" will be recorded, as this satisfies the subdomain wildcard. In this example, both the top "naked" domain matches and all immediate subdomains match. Any further levels of subdomains will not match. In this example, the top level "naked" domain, all immediate subdomains, and all second level subdomains will match. Any further levels of subdomains will not match. The exclusions are evaluated in order, so if multiple blocking rules could potentially apply to a domain, the first rule that matches will win out. For example, take subdomain.example.com and the following exclusion rules. In the above example, subdomain.example.com will be recorded because it matches *.example.com, this first rule, which has recording set to On. In the above example, the order of the exclusions is reversed from the previous example. In this example, subdomain.example.com will be blocked because it matches subdomain.example.com, the first rule, which has recording set to Off. For a complete list of all ways to block recordings, see Will I be able to block specific recordings?.